Each season we put together our trend collections. We love this season’s jewellery trends and have grouped the looks into four icons – Rebel, Dreamer, Ice Queen and Screen Goddess. Take our quiz below to find out which Icon of Style most suits your taste. Make a note of whether you answer mostly A, B, C or D…. You’ve just walked into a boutique, what’s the first fabric that catches your eye? Which Celebrity Red Carpet look has your vote? Which of these materials would you most likely wear? Which of these watches do you covet? d) Something smart with metallic details, eye catching! What would be your City Break of choice? Now tot up your results, did most of your answers fall into A,B,C or D? Check out your results below! You live by your own rules, turn convention on its head, brings anarchy and attitude to everything you do. Fearless and strong, you knows you can change the world. Your vivacious personality suits statement jewellery, with plenty of strong metal against dark fabrics. If a Leather jacket is your style staple then team it with a fierce Vivienne Westwood watch and layer up plenty of arm candy – for an investment piece, check out the Dinny Hall Almaz collection. Shop the Rebel collection here. Seductive and mysterious, you enchant everyone you meet. Yours is a life of high-octane glamour and timeless elegance, a life lived in style. You are an icon of sophistication, and a woman of substance. Your classic style and striking personality calls for plenty of Pearls and crisp metal. A Lulu Guinness watch will have you going giddy and Jersey Pearl will be the perfect addition to your Autumn wardrobe. Shop the Screen Goddess collection here. You care passionately, you feel deeply, you love wholeheartedly. Dreamers wear their heart on their sleeve and you bring dreams to life. You firmly believe in making the world a better place. You love symbols and icons and your jewellery collection probably already consists of charms and trinkets. You’d love the ChloBo collection and if you don’t have it already take a look at Nikki Lissoni, the interchangeable necklace brand that is taking the fashion world by storm. Shop the Dreamer collection here. You glitter and dazzle, shimmer and shine. Night is your kingdom, the stars your subjects, ice your jewels. You light up the room and sparkle like a star. Anything that shimmers and shines attracts you, you love a bit of bling. We have some fabulous ranges of super sparkly jewellery, Swarovski, Diamonfire and Nikki Lissoni to name a few – we think you’ll love our brand new Blowing in the Wind collection, dried leaves coated in beautiful Gold, Silver or Rose Gold! This Autumn/Winter the catwalk was awash with chic silhouettes from bygone eras. With a heavy nod to Film Noir and the Golden Age of cinema, models sashed down the catwalk in ultra feminine silhouettes heavily adorned in pearls and crystals. See Giorgio Armani’s pastel suits, Ellie Saab’s breathtaking gowns soaked in crystals to Lanvin’s Film Noirettes. This highly feminine trend calls for cinched waists, a flawless aesthetic and tons of pearls and stones. We love the rich emerald colours which contrast beautifully with crisp pearls. The Autumn/Winter catwalks told fairytales, referenced myths and legends and heavily adorned their models in religious iconography. Models wore crowns, heavily decadent crosses and dressed head to toe in religious paraphernalia. Dolce and Gabbana caused controversy in their decadent Roman Catholic inspired show, with rich Golds mixed with vibrant reds and oranges, each model wore an ornate cross, some in crowns and mini skirts. Alexander McQueen, Valentino and J.W Anderson referenced cassocks in their shows, putting religious costume in the spotlight. We love the references of religion, fairytales, dark arts, celtic iconography and new age inspiration – so turn to Chakras, charms, stars and hearts to express your inner Dreamer. This is a huge trend in jewellery with Pandora, ChloBo and Nikki Lissoni leading the way. This Winter we’ll be channelling our inner Ice Queens and adorning ourselves in Pave, Crystal, Silvers and Frosted metals. Chanel’s accessories have influenced the high street, with dazzling rings piled high, and sparkling hair grips. Their catwalk show included piles of sequins complemented by light and bright tweeds perfect for the Winter. Elli Saab’s collection mixed light chiffon with ice imprints which shimmered and sparkled like snow. We love this trend, which has been a huge story in the jewellery industry. Thomas Sabo’s Autumn/Winter Glam & Soul collection is adorned in Cubic Zirconias in Ice White Silver. Our brand new collection ‘Blowing in the Wind’ is a fabulous range of real leaves plated in Silver, Brass and Rose Gold to show their inner skeleton – perfect for your inner Ice Queen. We are mad for the Rebel trend that has graced the catwalk this season and love it’s street style reincarnation. A resurgence of the Punk and Grunge look, the epitome of the 90’s – this later incarnation has a heavy Leather influence with the quintessential Gold & Silver studs. See Yves Saint Laurent’s heavily adorned boots and grungy materials, Chanel’s thigh high Leather boots with chains, Burberry’s Studded Leather gloves and Moschino’s nod to Vivienne Westwood in their tartan outfits. This strong look requires plenty of attitude and is the perfect way to accessorise any Autumn outfit, choose between a Vivienne Westwood watch to the Almaz range from Dinny Hall to please your inner Rebel. Black is back! The arrival of Pandora’s new Autumn Winter Collection has sparked a lot of excitement among both customers and staff, with a new range of designs inspired by the ‘Enchanted Forest’. 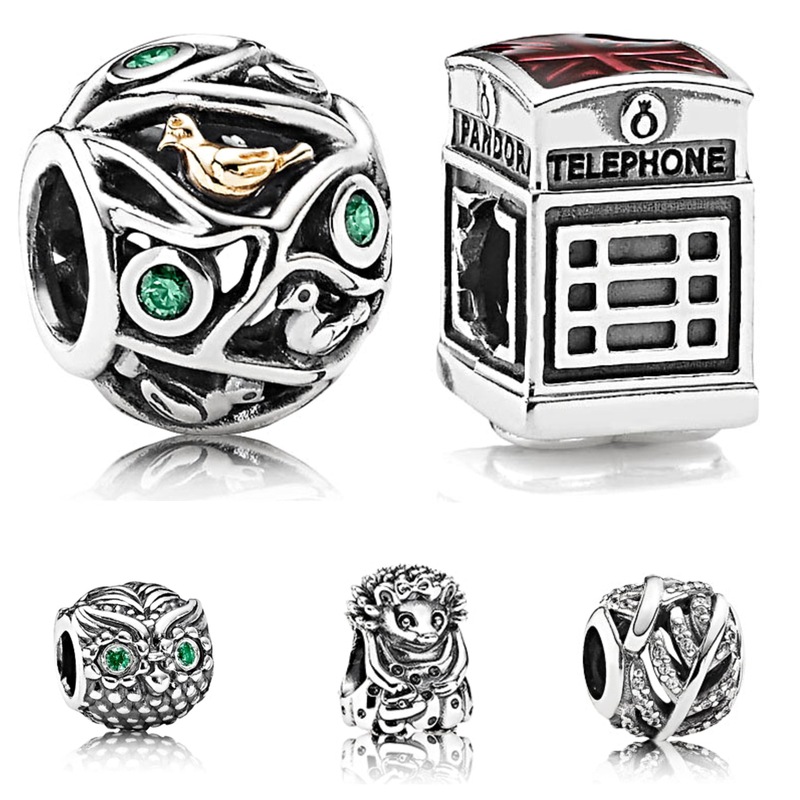 This beautiful collection features woodland creatures and national icons, as well as beautiful emerald green detailing within the classic sterling silver charms. A personal favourite of mine is the cubic zirconia Wise Owl charm with striking emerald-coloured eyes. The Birds and Branches charm is a favourite with the team here at Pandora Bath, a charm comprised of a sterling silver framework, dark green cubic zirconia and 14ct gold birds. The wealth of detail on the latest charms means they are guaranteed to stand out in your collection. I’m particularly excited about the new birthstone stud earrings designed to match the rings, put together they make a beautiful gift or set. The popular pavé diamond charms from the summer collection also feature in the new range, representative of the Autumn season. The ‘looking glass’ Murano glass charms from the summer collection have been a big hit, and there are now more colours in the new arrivals. 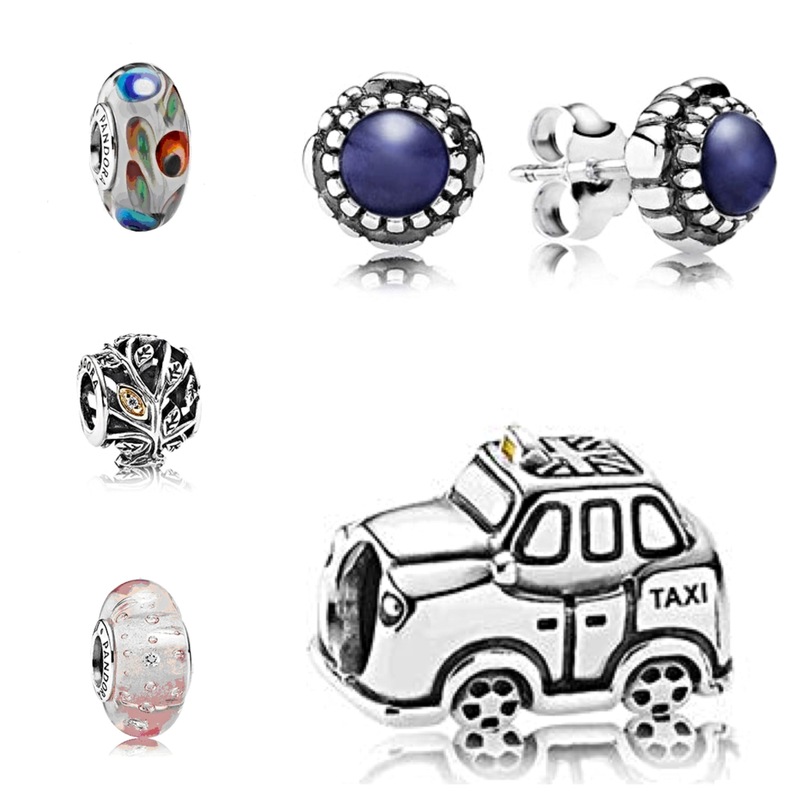 Even more, joining the London Union Jack Bus and the British Rose are two new charms quintessential of Britain; the Telephone Box and the London Taxi. Complementing the Autumn-themed charms are the new fabric string bracelets priced at only £35 in a choice of 3 colours; khaki, grey and black – I especially love the khaki! A new selection of rings also celebrates the seasonal change, particularly the leaves that decorate the ground. The Precious Heritage selection also features eye-catching rings, along with pendants and earrings in both amethyst and black spinel. Join us in-store and take a look at this brand new collection, or call us on 0845 4509334 for free UK delivery. Sapphire is the official birthstone for the month of September, a semi-precious stone famous for its deep blue hue and royal associations. Derived from the Latin word ‘“Sapphirus” and the Greek word “Sappheiros”, the name Sapphire means ‘Blue stone’. This gemstone appears blue due to the small amounts of titanium and iron within the crystal structure, and the most valuable Sapphires are those in the deep shade of Cornflower Blue. A symbol of faithfulness and sincerity, it is believed that wearing this gemstone will bring protection, luck and peace of mind. According to legend, Helen of Troy owned a large Star Sapphire which was the key to her desirability! Sapphires have been treasured by royalty for centuries and two of the most historically significant Sapphires rest on the Imperial State Crown worn by Queen Victoria. Now found in the British Crown Jewels in the Tower of London, this crown showcases the Stewart Sapphire acquired by George IV that weighs 104 carats, and the St. Edward’s Sapphire that once belonged to Edward the Confessor who wore this beautiful blue gem on a ring during his coronation in 1042. The Star of India is around 2 billion years old and is one of the largest Sapphires in the world. Donated to the American Museum of Natural History in the early Twentieth century, this beautiful gemstone is famous for its flawless milky quality and star effect. But perhaps the most famous Sapphire of the moment is on Kate Middleton’s engagement ring! First worn by Princess Diana in 1981, this beautiful ring features a show-stopping royal blue Sapphire surrounded by 14 sparkling diamonds! Hollywood royalty such as Joan Crawford and Elizabeth Taylor are known to be avid collectors of Sapphires, and the beautiful colour of Sapphire blue has long been a hit on the red carpet year by year thanks to its timeless glamour and elegance. Check out our fabulous collection of September birthstone jewellery here!